Jonathan Leake in The Sunday Times picks up on the news that the size of the Arctic ice cap has increased sharply to levels not seen since 2001, putting the ice extent two days ago almost at the average level for 1979-2000. Given the enthusiasm the media have shown for reporting Armageddon claims about the retreat of the ice, it is significant that his is the only such report in today's batch of newspapers – although The Daily Mail covered it briefly yesterday. Hitherto, the only detailed report had been on Watts up with that?. But what is especially significant about the Leake report is his interview with Mark Serreze, director of the National Snow and Ice Data Center (NSIDC) in Colorado. He is said to be "surprised" by the Arctic’s recovery from the great melt of 2007 when summer ice shrank to its smallest recorded extent. "In retrospect," he says, "the reactions to the 2007 melt were overstated. The lesson is that we must be more careful in not reading too much into one event." In making this declaration, Serreze is getting away extraordinarily lightly. It was he, after all, who was pre-eminent in stoking up the alarm over the Arctic ice melt, providing fuel for the warmists and driving much of the global warming scare as the ice extent became a poster child for the activists. It is therefore, appropriate to revisit some of Serreze's earlier pronouncements in the broader context of the scare as it developed, to see how this now cautious scientist treated the subject. That is the theme of this post. 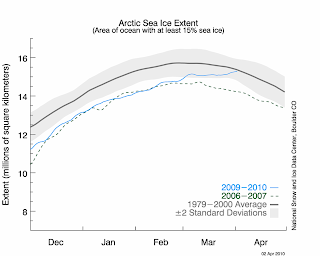 The baseline, of course, is 2007 when the ice extent dropped to a record low, as measured over the relatively short time period since continuous satellite monitoring had been started in 1979. And it was then, on 16 March 2007, that the Science Daily ran the headline, "Arctic sea ice decline may trigger climate change cascade". It was recording the views of the same Mark Serreze, then a senior research scientist at NSIDC. The Arctic sea ice extent had been dwindling for several decades and Serreze thought it might have reached a "tipping point" that could trigger a cascade of climate change reaching into Earth's temperate regions. He and his team attributed the loss of ice, about 38,000 square miles annually as measured each September, to rising concentrations of greenhouse gases and strong natural variability in Arctic sea ice. "When the ice thins to a vulnerable state, the bottom will drop out and we may quickly move into a new, seasonally ice-free state of the Arctic," Serreze said. "I think there is some evidence that we may have reached that tipping point, and the impacts will not be confined to the Arctic region." Serreze had not always been so certain. As late as 1992, after a 30-year study relying on more than one million measurements recorded in the Arctic between 1957 and 1986, he and his team had declared that they had found no evidence of global warming. Mark Serreze was unequivocal. His team had found no evidence that Earth was suffering from the greenhouse effect. But, offering a caution which he himself could well have heeded, he noted that a 30-year period of study might not be sufficient to determine a trend. 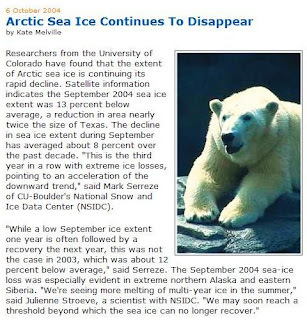 In 1995, however, Serreze had been looking at findings from the year 1990 and reporting that the volume of Arctic sea ice and snow cover had dropped to a record low. Already, he was beginning to change his tune, saying that he thought this might be an indication of global warming. Nevertheless, he obviously was not prepared to commit himself, stopping short of saying the Earth was showing signs of human-caused climate change on a planetary scale. Five years later, though, in August 2000, Serreze was firming up his view, conveyed in the pages of Science Daily again. 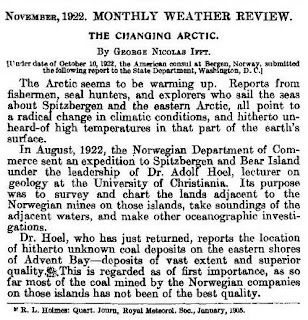 He was reporting that Arctic temperatures in the late 20th century had been "the warmest in four centuries," and had been accompanied by a variety of other environmental changes. Well short of the 30-year period he had earlier declared to be insufficient to determine a trend, he was now of the opinion that the changes appeared to be "at least partly a result of human activity". This was on the basis of a review completed by himself and nine other co-authors. "Our study validates climate-model results that predict the Arctic will be among the first regions on Earth to respond to a global warming trend," he said. This was dutifully reported by the BBC, which told us that US researchers were saying they had found evidence of rapid warming in parts of the Arctic over the last 30 years. The researchers were reported to have found that temperatures had risen significantly in a very short time in parts of the Arctic. Parts of Alaska and northern Eurasia, for example, had warmed by nearly six degrees Celsius in the winter months since the early 1970s. Nevertheless, at the end of August, Serreze was warning that the North Pole could be ice-free that summer. But he was also telling The New York Times that his team was "still not sure" if the diminishing polar ice reflected some short-term natural cycle or was "a wake-up call of possibly drastic climatic consequences of an industrial civilization's release of heat-trapping gases." "There seems to be a pretty coherent picture of change going on now in the Arctic," Serreze remarked. "But there's nothing to be necessarily alarmed about. There's been open water at the pole before. We have no clear evidence at this point that this is related to global climate change." 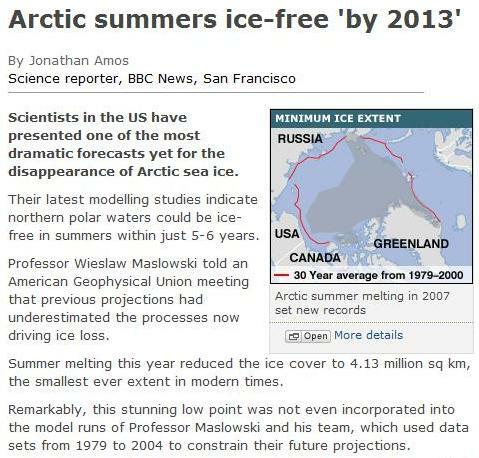 Just over two years later, though, in December 2002, the BBC was reporting "Record ice loss in Arctic". This was based on the work of Serreze and his team, but they were still being cautious. They attributed the increased melt to an unusual low-pressure system that "came earlier and stayed longer", to create unseasonable warm temperatures. Serreze agreed that such a low-pressure system was characteristic of the Arctic Oscillation, an "atmospheric sea-sawing" that produces warm weather. But he was veering into the warmist camp. He calculated that warming had produced roughly 20 percent loss in Arctic sea ice since 1978. But not all warming he said, was due to natural variability. "The Arctic Oscillation can't explain everything," said Serreze. "To what extent these may be human-induced changes is very difficult to say, and Arctic Oscillation itself is subject to human influence," he said. But despite that, he remained suspicious that an aberrant Arctic Oscillation was behind the unusual circulation patterns that had weakened sea ice the previous winter. After the summer melt in October 2003 – following another significant loss of ice - Serreze was firmly in the warmist camp. He told the New Scientist: "Climate is changing, the Arctic is changing rapidly, and it has significant effects on lower latitudes." With an increased melt the following year, in October 2004 Serreze and his team were then reporting a minimum level 13 percent below average, a reduction in area nearly twice the size of Texas. 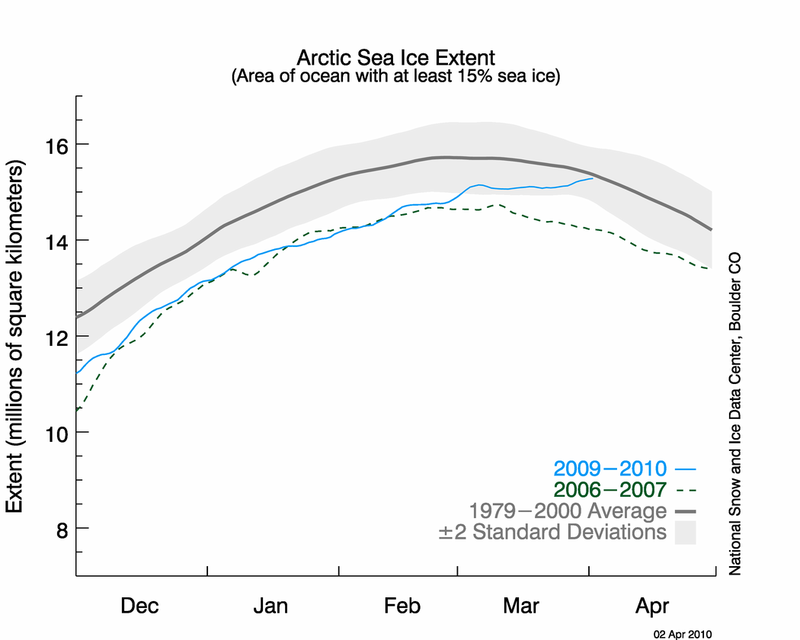 The decline in sea ice extent during September had averaged about 8 percent over the past decade. "This is the third year in a row with extreme ice losses, pointing to an acceleration of the downward trend," said Serreze. "While a low September ice extent one year is often followed by a recovery the next year, this was not the case in 2003, which was about 12 percent below average." "However, the most reasonable view is that the sea ice decline represents a combination of both natural variability and the greenhouse effect, with the latter becoming more evident in coming decades," he continued. By now, various commentators were predicting a complete loss of ice over various timescales, and Serreze was nodding his head in that direction. 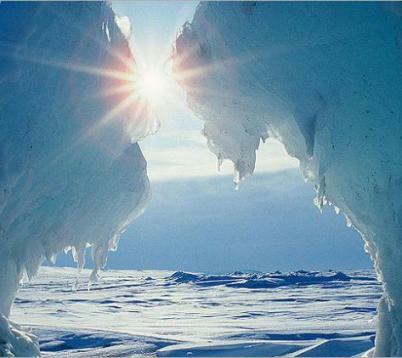 "Some indicate complete disappearance of the summer sea ice cover by 2070," he said. But the vestiges of the scientist remained. He believed natural climate variability played some part in the changes. In September 2005, The New York Times was reporting that "sea ice on the Arctic Ocean had shrank that summer to what is probably its smallest size in at least a century of record keeping." Serreze was once again to the fore with his analysis. It had been the fourth year in a row that the ice area had fallen sharply below the long-term average and this once-cautious scientist had abandoned any idea of natural variability as a significant factor. While the Arctic Oscillation had contributed to the reduction in Arctic ice in the past, he stated, it "did not appear to be a factor in the past several years." The role of accumulating greenhouse gas emissions had become increasingly apparent with rising air and sea temperatures. He said that more variability could lie ahead and that the area of sea ice could actually increase some years. He and his team had found "few hints" that other factors, like more Arctic cloudiness in a warming world, would reverse the trend. "With all that dark open water, you start to see an increase in Arctic Ocean heat storage," said Serreze. "Come autumn and winter that makes it a lot harder to grow ice, and the next spring you're left with less and thinner ice. And it's easier to lose even more the next year." The result, he said, is that the Arctic is "becoming a profoundly different place than we grew up thinking about." In March 2006, the National Geographic was picking up on the winter maximum ice extent, noting that for the second year in a row a large amount of Arctic sea ice did not refreeze. Relying in Serreze and his team, it reported that this "trend" may indicate an overall shrinking of Arctic ice cover due to rapid global climate change. And the man was more willing to nail his mast to the predictions of disaster. "Some calculations say that by 2070 we will have no sea ice left," he said. "It's always dangerous to make predictions, but we are right on schedule for this to occur." In September 2006, Serreze was telling The Washington Post that only five years ago he had been "a fence-sitter" on the issue of whether man-made global warming was happening and a threat. But he said recent evidence in the Arctic had him convinced. The summer sea ice had set a record low the previous year and, although that year's measurements had not been as bad, they would be close to the record. This brings us to the year of 2007, the year of the IPCC report, and the year when – as we have already seen – ice extent dipped substantially. Serreze, the former scientist, threw caution to the wind. In the Canadian press under the headline, "Climate change causing Arctic ice meltdown", he was seen to be commenting on the "unlocking" of the fabled Northwest Passage. Describing the phenomenon as clear proof that global climate change was under way, the NSIDC said on its website that "analysts at the Canadian Ice Service and the US National Ice Center confirm that the passage is almost completely clear and that the region is more open than it has ever been since the advent of routine monitoring in 1972." 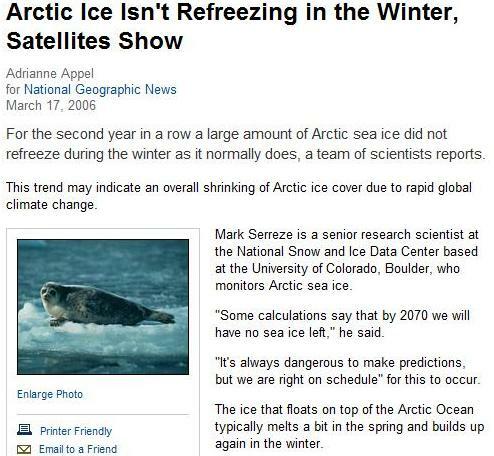 And Serreze, "concerned at the accelerated annual loss of Arctic ice", was predicting that the entire polar region, including the North Pole, could witness a total summer melt by 2030. But it was to get worse. He must have been even more "concerned" by December 2007 as he was being distinctly upstaged. As recorded by the BBC, Professor Wieslaw Maslowskiv from the Naval Postgraduate School, Monterey, California, had presented "one of the most dramatic forecasts yet" for the disappearance of Arctic sea ice. He and his team were offering "modelling studies" that indicated northern polar waters could be ice-free in summers within just 5-6 years, putting the complete disappearance of summer ice at 2013. Remarkably, the then current "stunning low point" was not even incorporated into the model runs of Maslowski and his team, which had used data sets from 1979 to 2004 to make their projections. 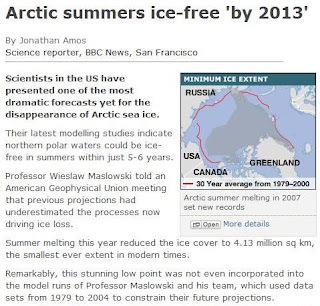 "Our projection of 2013 for the removal of ice in summer is not accounting for the last two minima, in 2005 and 2007," Maslowskiv explained to the BBC. "So given that fact, you can argue that may be our projection of 2013 is already too conservative." Not to be outdone, Serreze was back in the fray in June 2008, offering 50-50 odds that the North Pole would be ice-free that summer, "a first in recorded history", he claimed. And, even if it didn't happen that year, it was "just a matter of time". The explanation was a warming climate and a weather phenomenon, "scientists said." With predictions mounting that the 2008 melt could surpass the "extraordinary 2007 record low", in the August, Serreze was talking to Reuters, telling them that last year's record was blamed squarely on human-spurred climate change. "No matter where we stand at the end of the melt season it's just reinforcing this notion that Arctic ice is in its death spiral," said Serreze. The Arctic could be free of summer ice by 2030. Despite the doomsayers' predictions, there was a very slight recovery in the summer minimum. Nevertheless, by October, WWF was getting in on the act, claiming that climate change was "faster and more extreme" than feared. Echoing Serreze, it stated that the first "tipping point" may have already been reached in the Arctic, where sea ice was disappearing up to 30 years ahead of IPCC predictions. It may be gone completely within five years - something that hasn't occurred for a million years – the group warned. 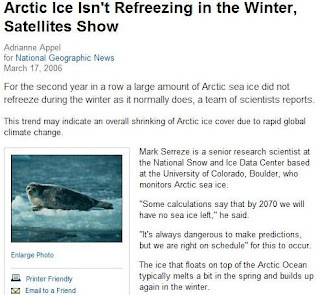 Even as the recovery continued, in April 2009 the NSIDC, this time in the form of Walt Meier, a research scientist, was saying that the Arctic Ocean "will" be effectively ice free sometime between 2020 and 2040, although it is possible it could happen as early as 2013. Nasa figures were showing an increase in winter sea ice to 5.85 million square miles, 282,000 square miles above the record low of 2007. However, we were told, this was still the fifth lowest "on record" and 278,000 square miles less than the average extent for 1979 to 2000. Crucially, much of it was one-year ice and more prone to summer melting. "Most people would agree it is not a matter of if we lose the summer sea ice but when," said Meier. "Temperatures are still warming because of carbon dioxide in the atmosphere and the greenhouse effect. Even if we stopped that temperatures will continue rising and we will see 'positive feedback' where the ocean absorbs more energy therefore increasing the melting effect." Meanwhile, another study was claiming that: "virtually all the sea ice in the Arctic will have melted during the summer months by 2037, and that it may even disappear as soon as the summer of 2020." The survey was carried out by scientists from the US National Oceanic and Atmospheric Administration (NOAA) and the University of Washington in Seattle "using the six most sensitive computer models of the Arctic region." In an interview in June 2009, Serreze, who had then recently been made director of NSIDC, dismissed the "breathtaking ignorance" of blogs like Watts up with that?, amplifying the reasons for his "death spiral" claim. Spring, he said, is increasingly dominated by thin, first-year ice prone to melting out in summer. As the thin ice now starts to melt out earlier in summer, the albedo feedback is stronger meaning even more summer melt. Then, the Arctic was warming in all seasons, meaning that recovery through a series of cold years was becoming less and less likely. Take these three together, and you are probably looking at ice-free summers by 2030. "I'd call that a death spiral", he concluded. Irritatingly though, the Arctic ice refused to conform with the warmist script, leading Christopher Booker to note in the September that it was proving to be "slippery stuff". The extent of the sea-ice was half a million square kilometres more than it had been at the same time the previous year. BBC viewers had by then been treated to the bizarre spectacle of Mr Ban Ki-moon standing on an Arctic ice-floe making a series of statements so laughable that it was hard to believe such a man could be Secretary-General of the UN. Thanks to global warming, he had claimed, "100 billion tons" of polar ice are melting each year, so that within 30 years the Arctic could be "ice-free". This was supported by a WWF claim that the ice was melting so fast that, by 2100, sea-levels could rise by 1.2 metres (four feet), which would lead to "floods affecting a quarter of the world". This did not stop the National Geographic posing the question in October: "Arctic largely ice free in summer within ten years?" 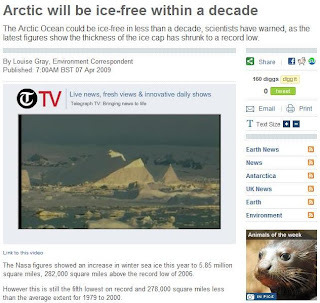 But there was a note of uncertainty as it recorded: "The Arctic Ocean could be largely ice free in summer within a decade, scientists announced today - the latest in a stream of wildly varying predictions." Predictions were now ranging from ten years, to the view presented by the Catlin Arctic Survey and WWF, which put it at 20 years, to the NSIDC considered view that the Arctic's summer sea ice would fully melt around 2030. Other groups had put the ice-free date as late as 2100. Asked to explain why there were so many "seemingly wild guesses", Serreze said, "When we lose the ice really depends on the natural variability in the system." 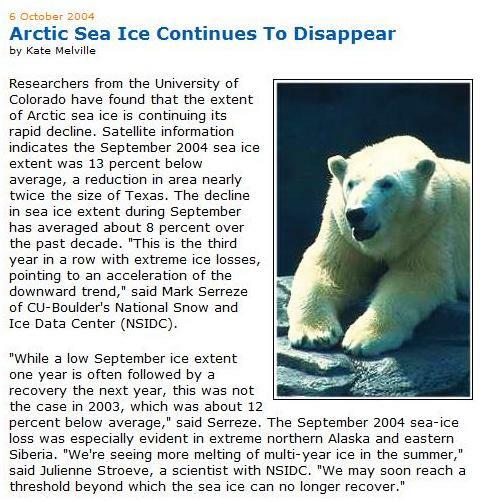 However, the summers of 2008 and 2009 had seen some recovery of Arctic ice. The long-term trend is still for shrinking ice, Serreze insisted. "Will the slow, steady trend be the norm? 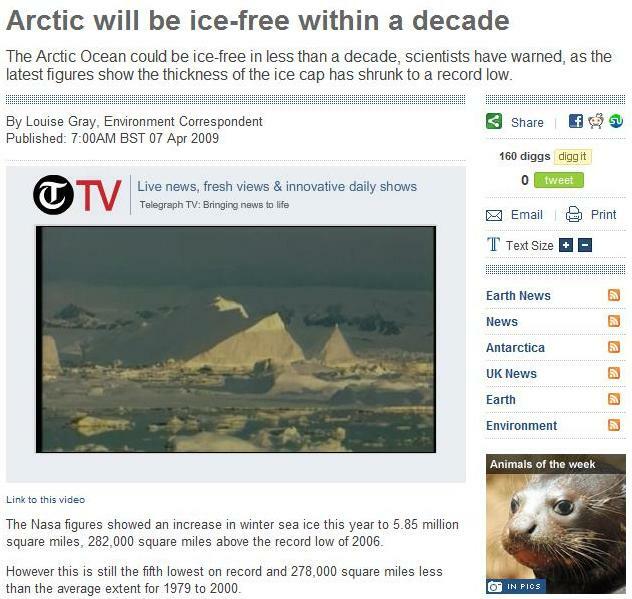 Or will another year like 2007 come along and wipe out the Arctic ice?" he was asked. "These are the unknowns," Serreze said. "We simply don't know." The Globe and Mail broke the news of the increased ice extent on 1 April 2010. "It is not the end of global warming," said Mark Serreze. "This is weather," he added. "Don't conflate this with climate." Three years of ice recovery, of course, is not long enough to establish a trend – not when the egregious Serreze had nearly twenty years ago warned that even 30 years was not long enough. But, had Serreze stuck to his guns, and held with the thesis of climate variability, he could have called in aid The New York Times of 20 February 1969 (10 years before the satellite record began), which recorded massive thinning of the polar ice, with predictions that "the North Pole may become an open sea within a decade or two". 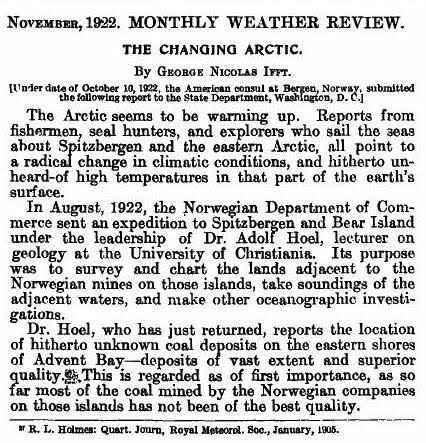 Similarly, he might have relied on a report, courtesy of WUWT, on 10 October 1922, which recorded: "The Arctic seems to be warming up". Ice conditions were "exceptional" – so little ice had "never before been noted". This ties in admirably with the remarkable book published in 1943 by the Russian professor of geographical science, N N Zubov (p.470 et seq). He records in the same time period, considerable glacier melting, increased temperatures and in 1935 a positive anomaly in Spitzbergen of 10°C. The ice area in the Greenland Sea from April to August for the period 1921 to 1938 was 15-20 percent less than for the period 1898 to 1920. The ice abundance for the same months in the Barents Sea from 1922 to 1933 was 12 percent less than the period 1900 to 1919. Coming right up to date, we have Hiroshi L Tanaka of the University of the University of Tsukuba in Japan. He tells us, that the arctic warming before 1989 especially in winter was explained by the positive trend of the Arctic Oscillation (AO). Moreover the intensified Beaufort High and the drastic decrease of the sea ice concentrations in September after 1989 were associated with the recent negative trend of the AO. Since the decadal variation of the AO is recognized as the natural variability of the global atmosphere, Tanaka adds, "it is shown that both of decadal variabilities before and after 1989 in the Arctic can be mostly explained by the natural variability of the AO not by the external response due to the human activity." So much for Serreze's "death spiral". The only such "spiral" we can reliably observe is in the warmist creed, which is currently in free-fall.